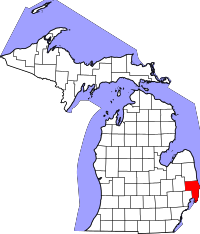 St. Clair County is a county located in the U.S. state of Michigan bordering the west bank of the St. Clair River. As of the 2010 census, the population was 163,040. It is the 13th-most populous county in the state. The county seat is Port Huron, located at the north end of the St. Clair River at Lake Huron. The county was created September 10, 1820, and its government was organized in 1821. Located northeast of Detroit, St. Clair County is part of the Detroit-Warren-Dearborn, MI Metropolitan Statistical Area. Geographically, it lies in the Thumb area of eastern Michigan. An expedition led by the French explorer René Robert Cavelier, Sieur de La Salle named the namesake lake as Lac Sainte-Claire, because the Roman Catholic men entered the lake on August 12, 1679, the feast day of Sainte Clare of Assisi. English maps identified the lake feature on maps as early as 1710 as Saint Clare. By the Mitchell Map of 1755, the spelling was given as St. Clair, which is the current version. Located along the western shores of Lake St. Clair and the St. Clair River, the county was named for them. The name is sometimes attributed to honoring Arthur St. Clair, an American Revolutionary War General and Governor of the Northwest Territory, but it was established with the current spelling long before St. Clair was considered a notable figure. The earlier spelling of the lake's name may have been conflated with that of the general, as several political jurisdictions near the lake and the river, such as St. Clair County, St. Clair Township, and the cities of St. Clair and St. Clair Shores, share this spelling. See also, List of Michigan county name etymologies. The name has sometimes been attributed to honoring Patrick Sinclair, a British officer who purchased land on the St. Clair River at the mouth of the Pine River. In 1764, he built Fort Sinclair there, which was in use for nearly 20 years before being abandoned. St. Clair County is also called the Blue Water Area. According to the U.S. Census Bureau, the county has a total area of 837 square miles (2,170 km2), of which 721 square miles (1,870 km2) is land and 115 square miles (300 km2) (14%) is water. St. Clair County is one of five counties that form the peninsula, known as the Thumb, that projects into Lake Huron. St. Clair County is closely connected in terms of economy with its neighbors, Metropolitan Detroit and Sanilac County in Michigan, and Lambton County across the river in Ontario, Canada. Saint Clair County is the principal county in The Blue Water Area, a sub-region of the Thumb. I-94 enters St. Clair County from the southwest, having traversed the entire Metro Detroit region, and terminates at the approach to the Blue Water Bridge in Port Huron. On the Canadian side of the border, in Sarnia, Ontario, the route heads easterly designated as Highway 402. M-25 follows the Lake Huron–Saginaw Bay shoreline, beginning in Bay City and ending at a junction with |I-94/|I-69, and BL I-94/BL I-69 on the north side of Port Huron. M-154 serves Harsen's Island, in Lake St. Clair. There were 63,841 households out of which 31.3% had children under the age of 18 living with them, 52.9% were husband and wife families, 11.4% had a female householder with no husband present, 30.7% were non-families, and 25.5% were made up of individuals. The average household size was 2.52 and the average family size was 3.01. In the county, the population was spread out with 23.7% under age of 18, 8.0% from 18 to 24, 23.8% from 25 to 44, 30.1% from 45 to 64, and 14.5% who were 65 years of age or older. The median age was 41 years. For every 100 females, there were 98.1 males. For every 100 females age 18 and over, there were 95.7 males. The 2010 American Community Survey 1-year estimate indicates the median income for a household in the county was $44,369 and the median income for a family was $53,207. Males had a median income of $30,056 versus $16,771 for females. The per capita income for the county was $22,390. About 10.4% of families and 15.4% of the population were below the poverty line, including 22.7% of those under the age 18 and 6.8% of those age 65 or over. St. Clair County is home to five county parks: Columbus County Park, Fort Gratiot County Park, Fort Gratiot Light station, Goodells County Park, and Woodsong County Park. St. Clair County also operates the Wadhams to Avoca Trail and works with local units of government to develop the Bridge to Bay Trail. ^ a b c d "Bibliography on St. Clair County". Clarke Historical Library, Central Michigan University. Retrieved January 29, 2013. ^ a b c "American Factfinder". United States Census Bureau. Retrieved March 11, 2012. ^ "Columbus Park Overview" (PDF). Retrieved 2014-01-02. Fuller, George Newman (2005) [1926?]. "Indians and Explorations". Local history and personal sketches of St. Clair and Shiawassee counties. Ann Arbor, Mich.: University of Michigan Library. pp. 17–27. Retrieved 2007-11-23. Jenks, William Lee (2005) . "Origin of Name". St. Clair County, Michigan, its history and its people. Ann Arbor, Mich.: University of Michigan Library. pp. 20–24. Retrieved 2007-11-23. "Bibliography on St. Clair County". Clarke Historical Library, Central Michigan University. Retrieved January 29, 2013.